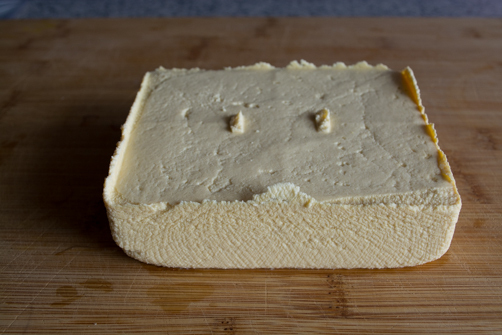 Today I’m sharing my notes on how to make tofu. I had never considered how to make tofu up until a few weeks ago. I knew it was made from soybeans and that was where my knowledge and curiosity ended. But as the world turned so did my imagination and I started to contemplate the deep mystery that is tofu, which lead to googling. A lot of googling. I went with the top listed result from La Fuji Mama and was not disappointed. Her post is detailed and brimming with lovely and reassuring photos to guide you through this new experience. I’m happy to say I’ve made tofu four times now! 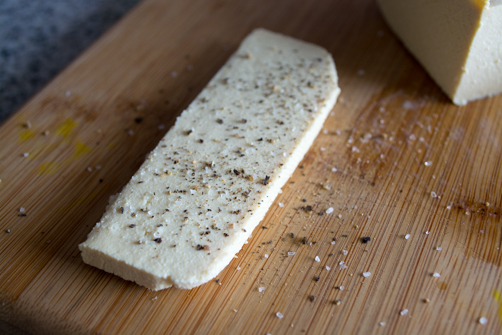 While I won’t forsake the convenience of store-bought I love knowing how to make my own high-quality organic tofu. No arguments that store-bought is an easy answer, but I cannot deny how absolutely delicious and fresh homemade tastes. 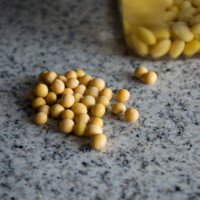 While some have claimed the same about homemade nut milks, I’ve never had the thrill (besides cashew milk) that I do from the taste of homemade tofu. It’s decadent and creamy. So much so that it reminded me of fresh mozzarella. Add a small amount of lemon juice or ACV with some salt and I’m sure you would have a close contender. We even sprinkled slices with a smattering of salt and pepper—we could barely contain ourselves. I happened to have fresh pesto on hand, which we spread across small slivers. Euphoric. My method follows La Fuji Mama’s closely but not exactly. 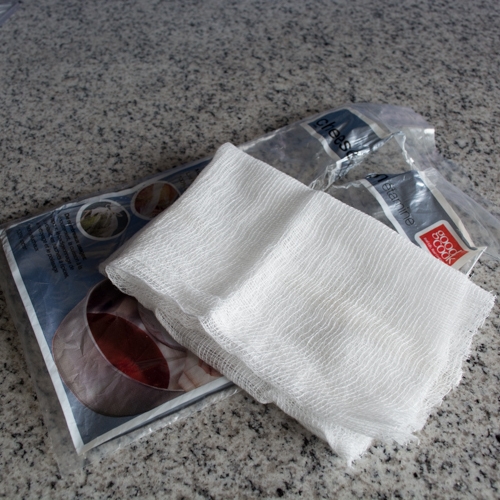 I’ve tweaked a few things that work better for my kitchen and the way I like to tackle things. One of the biggest differences is I used my TofuXpress press instead of the medley of containers I used the first time around. My alterations also eliminated the need to run tap water for 15 minutes straight (I know!). If you already have a TofuXpress, I bet you didn’t know it would be such a valuable addition to your world of tofu. Enjoy! Soak the beans overnight, strain the soak water, blend the beans with additional water, cook mixture, strain mixture (this results in soy milk and okara), take the soy milk and place it back on the stove, add the coagulant, let sit, strain liquid from the curds, and finally press the curds to yield a tofu block. 1. 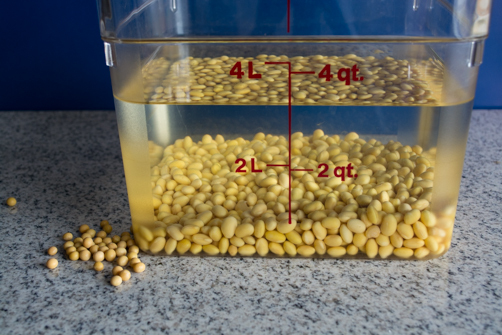 Soak 1 and 1/3 cups of organic soybeans in plenty of water overnight (or 12 – 24 hours). 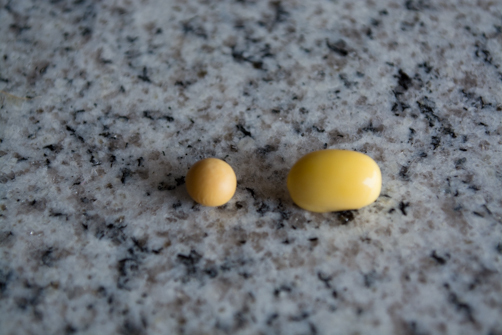 I thought it was just crazy that these round little soybeans, about the size of a bb gun pellet, expand into an oblong shape. Most beans when soaked just become bigger versions of themselves, but these guys change shape completely. 2. 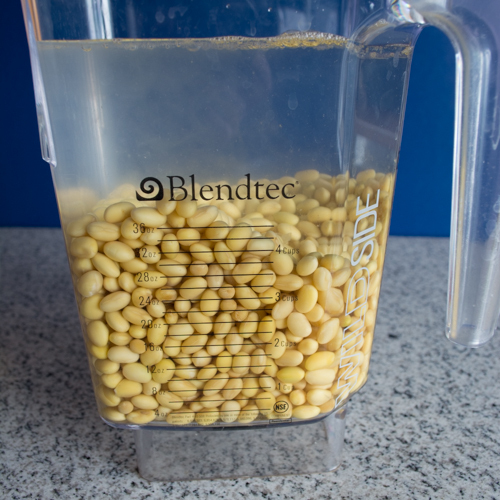 Strain the soak water and place the beans in your Blendtec Wildside container (if using a food processor blend in multiple batches) and add water—maybe a little bit less than I did in the photo—it made it, but it was close. 😉 3. 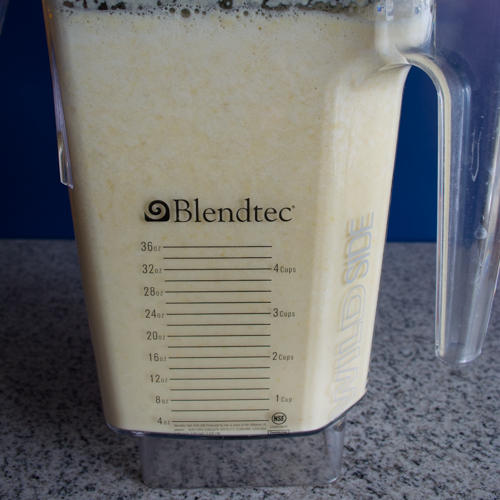 Blend on the ‘whole juice’ setting, which is about 55 seconds long. 4. 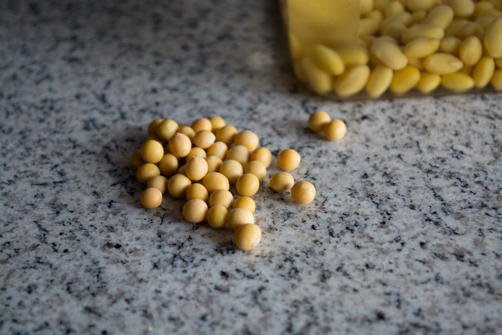 In a 6 quart pot or larger, add the ground soybean mixture + 5 cups of water and bring to an almost boil. Be very careful during this step. I boiled over in each of my first 3 batches. It was in those moments where I looked away for a second and let me tell you, it is a pain to clean up. When it’s almost to boil, turn down the heat to low and cook for 8 minutes – stirring occasionally. 5. 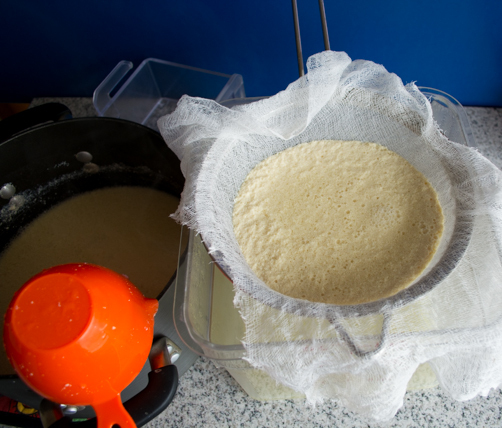 After the 8 minutes on low, set up your bowl or food grade container with a mesh sieve on top and a nut milk bag in that. 6. Strain the mixture through the nut milk bag. This will result in a collection of soy milk in the container and okara in the nut milk bag. This part is very similar to how you make nut milks but the mixture is very hot. 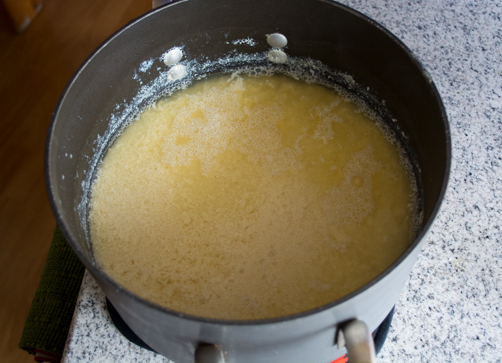 It helps to wear rubber gloves or use a ladle to press and squeeze the mixture. It’s important to get as much soy milk out as you can. Meet okara and soy milk. The okara is very thick and soft – kind of like too thick hummus. It is a nice off-white color. 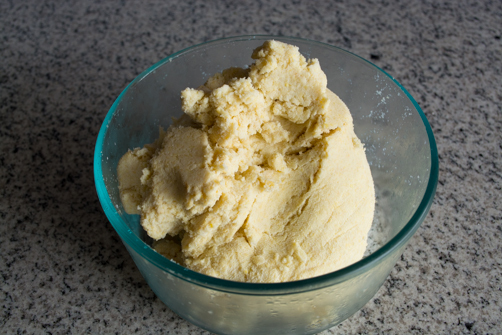 Save the okara and stay tuned for ways to use it in your cooking and baking endeavors. On the bottom is soy milk. If you wanted to stop here, you could, and you’d have fresh organic soy milk—just bottle it and store it in the refrigerator. 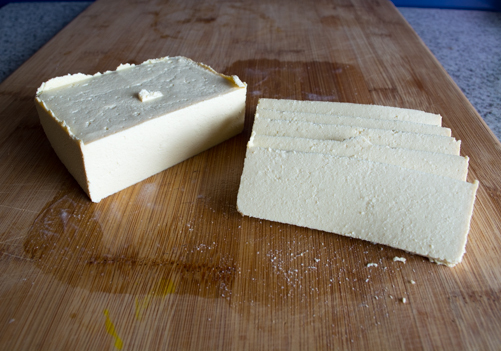 If you still want to make tofu, soy milk is how we get there. 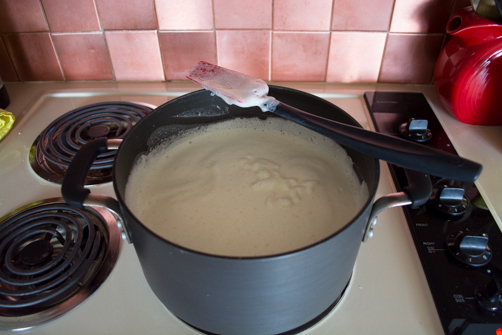 Now clean up your stock pot—if that’s the only one you have—and place it back on the stove, add the soy milk to the pot and heat on medium-low heat, stirring consistently, until the temperature is up to 155-160ºF (I took measurement with a meat thermometer). 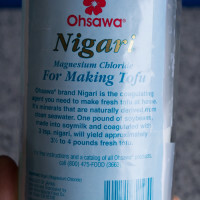 While the temperature is rising, mix the remaining 1 cup of water with 2 1/2 teaspoons of powdered nigari until it’s dissolved—this is your coagulant. 7. When the temperature is right, remove the pot from the heat. 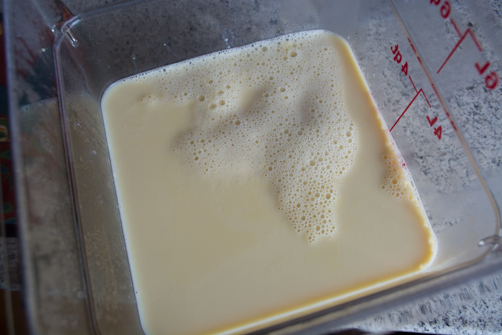 While stirring constantly, add 1/2 of the coagulant to the warm soy milk and stir vigorously. Allow it to settle and add the remaining coagulant and stir. When things begin to separate (see above), cover the pot and let it sit for 15 minutes undisturbed. 8. 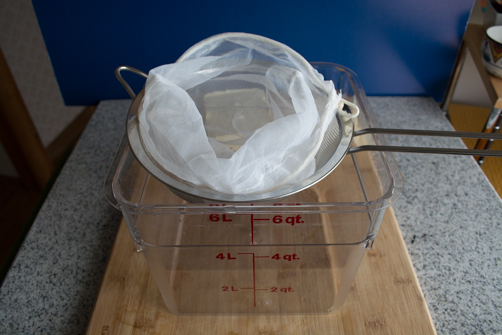 Now using your food grade container or bowl, set your sieve on top again. This time lined with cheese cloth. Transfer the separating soy milk to the lined sieve. 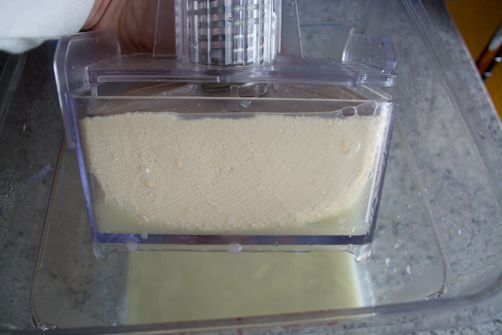 This will strain the tofu ‘curds’ from the disposable liquid. I do this in steps by placing several cups in the sieve, letting it drain and then adding a few more cups until the pot has been emptied. Here is a close up picture of the tofu ‘curds’. I’m contemplating—for the future—that this would be a pause point for an opportunity to mix in fresh herbs, tamari, or miso for some unique and flavorful variations. 9. 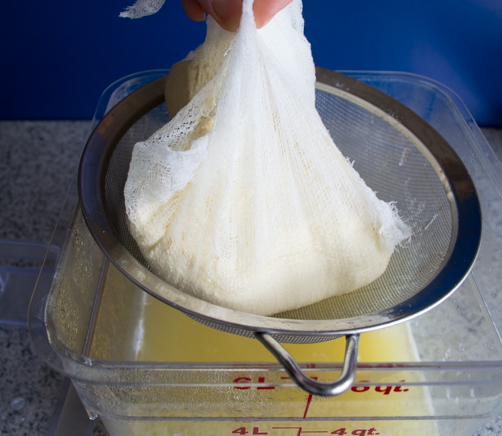 Once the majority of the liquid has drained, carefully pick up the cheese cloth and place it in your TofuXpress. Alternatively, you could leave it in the colander and set with weights—but it won’t firm up as well. 10. 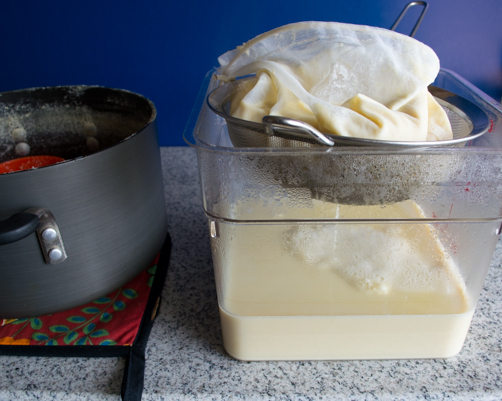 Once you’ve placed it in the press, fold over the cheese cloth so it lays across the top, place the lid on and slowly put pressure until you’re able to turn the top piece and clamp it. It’s best to do this over the sink or in a bowl as more water will be released in the first 20 minutes. 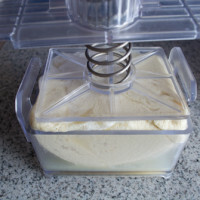 The genius part of the TofuXpress is the pressurized spring that clamps the lid down and presses the freshly made tofu (to form and set the curds) or store-bought tofu (to release water). I used to press my store-bought tofu between 2 cutting boards topped with all my exercise weights. The two methods don’t even compare. From when I started pressing this (in the picture), to when I stopped (the next day)—the lid made it half way down the container. 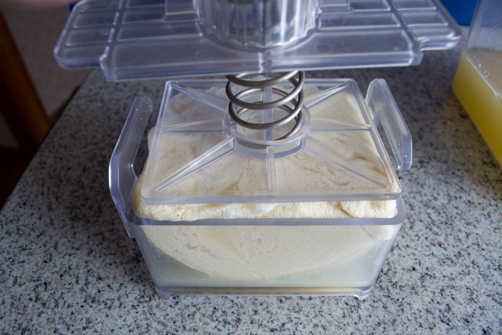 The nice thing about this press is you can control the tofu’s firmness, depending on the the press time. Not to be confused with making a silken tofu though, I think that would involve less nigari and not so much to do with pressing time. 11. 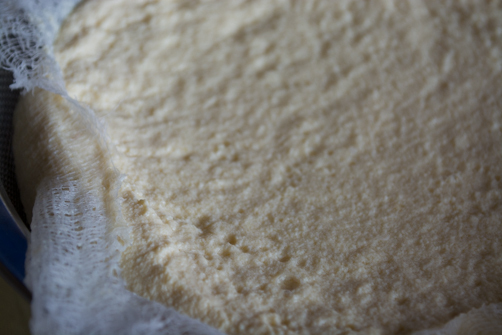 Once pressing is done, gently release and pry off the lid (it might stick a little). Cut a few fresh slices to try or store the block in a container covered in water. Fresh tofu is ridiculously delicious! 95% of okara is used in feed for livestock and only a small amount is used in cookery [source] – what a shame! It’s delicious! Thanks for the excellent overview! Can I ask- did you use the regular tofu tension spring or the light tension spring 2 attachment?